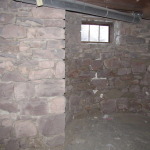 Our granite walls are beautiful thanks to a day of sandblasting, but the rest of my house is a dusty mess! I feel like I can empathize a lot more with the women of the 1930s who dealt with the Dust Bowl – except, I only have to clean up after one “dust storm,” and for them it was a regular occurrence. After the sandblasters left, Parker and I cleaned the main floor of the house while Shon and a friend cleaned the basement. 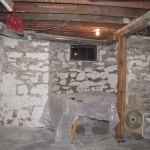 Once they had the sand scooped and vacuumed up, we all stood in the basement and just reveled at the beauty of the foundation laid more than a hundred years ago. Now that the paint is off the concrete floors and the plaster/paint is off the granite walls, Shon and I can easily imagine how things will look once the space is finished. 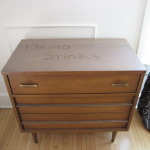 We’ve come a long way and have only a little left to do before the professionals can get to work. 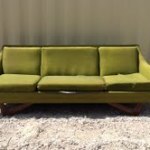 The hunt for a Mid Century couch is over! 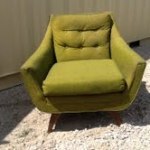 I connected with the owners of Modtro, a downtown vintage store which opens its doors each month for a sale, and they sold me this great sofa and chair that I’m going to add to the list of items that need upholstered. Speaking of upholstery – I found a great upholsterer in Tea through word-of-mouth and by seeing his work first hand. Kevin the owner of K-Kraft. Now, the big challenge will be selecting the right fabric and getting it for the right price. Selecting a fabric that both Shon and I agree on, is a difficult task which contains many challenges. First, there are limitless options. Second, Shon and I don’t agree on our favorites – which in its own way is quite limiting. And third, many times my favorite option is out of my budget – again limiting (so why am I complaining about limitless options!) Because, even with limitless options, I have not fallen in love with any that are within budget and Shon and I both agree upon. For this couch, however, I found some charcoal grey wool for only $5/yard, AND Shon likes it too! So, it’s a win-win. Kevin this couch will be coming your way soon.